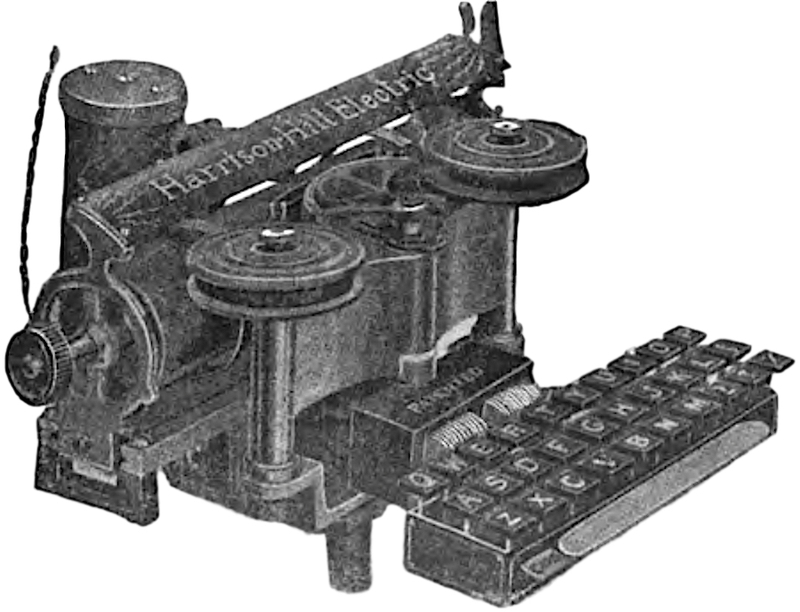 Nothing came of the Harrison-Hill Electric Typewriter, which was essentially a modified Hammond, and it ranks among the “unsuccessful” typewriters of the early 20th century. 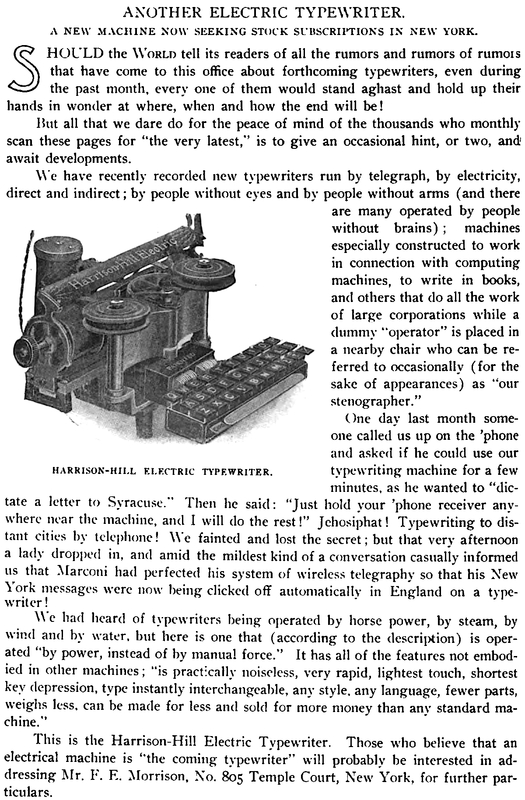 Electric typewriters were particularly unsuccessful in the first decades of the century because of the technical challenges: non-standardized currents, limited coverage, and limited access to outlets. The idea of an electric typewriter, however, was always tantalizing. The Hammond was frequently adapted for this purpose, as it employed an efficient type-shuttle mechanism, though the more successful machines (of a later period) employed the standard type-bar mechanism. Introduced to the press in 1903, the Harrison-Hill or Prendergast typewriter was invented by John Swainson Harrison and Hermon Hill. Their story is ably told by Robert Messenger at oz.Typewriter here, and there are some sad elements. The above image may well be the only known photo of the machine. I located two of those patents: U.S. 718,929, Jan. 20, 1903 for a Type Writing Machine (here) & U.S. 728,711, May 19, 1903, for a Type Carrier and Selecting Mechanism (here). Designing an electric typewriter was not a difficult task, but finding an electric outlet in 1903 was. Many appliances were powered by light-socket extensions or banks of batteries, which was hardly efficient. Plus, manual typewriters worked very well. Consumers were hard pressed to justify the additional cost of an electric typewriter. The Harrison-Hill received only brief notices in the press. Amazing machine! Maybe one will turn up in a thrift store, like the Clark Electric. The dismissive tone of the 1903 news story is amusing … or sad. That ETCetera issue on the Clark was fascinating.